HERE is the Two of Hearts… signed by three survivors of the sinking of the RMS Titanic. This picture appeared in the New York Sun on Sunday April 21, 1912. It seems richly symbolic of the hand dealt by fate that night – depicting as it does how three men survived, and one died, on the turn of a card. The Three Frenchmen Autograph the Pack for Souvenirs. 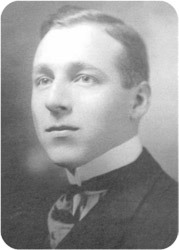 Pierre Maréchal, son of the Vice- Admiral of the French navy, one of those rescued from the Titanic, brought away the souvenirs of the disaster illustrated here. 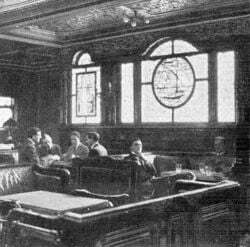 When Captain Smith gave the alarm, M. Maréchal, with Lucien Smith, Paul Chevré, a French sculptor, and A. F. Omont, a cotton broker, were in the Café Parisien playing bridge.The three Frenchmen in the party were saved and the American was lost. M. Maréchal gathered up the cards and put them in his pocket, expecting to resume the game. Yesterday the survivors autographed them and sent them to their friends in France. 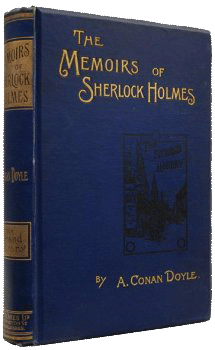 M. Maréchal also brought away a volume of The Memoirs of Sherlock Holmes, which he had taken to read on board the liner. He also had the remarkable experience of remaining in the water forty minutes without having his monocle displaced. He was picked up by lifeboat 7, in which there were only twenty passengers. M. Maréchal said that it could easily have taken fifty. 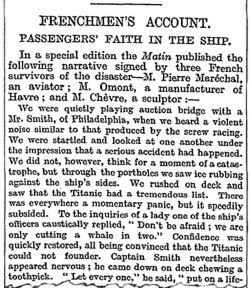 The article discloses a fact not known in modern times – that signed cards from the very pack saved off the Titanic were posted to friends in France. Remarkably, none of these souvenirs – to the best of knowledge – has ever turned up publicly for sale or auction. The Maréchal descendants have the Two of Hearts. Omont's family has another card, signed by all three men but whose nature has never been disclosed. 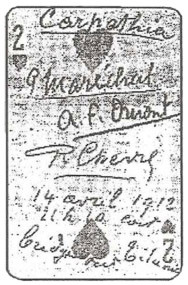 The card sent to Chevré's family has disappeared in the intervening decades. And nobody knows of the "friends" who may have received others. The cards were a gilt-edged variety manufactured for the White Star Line by Goodall & son Ltd of London. The New York Sun also printed a picture of the reverse of a card, with its central red burgee, which may be why the newspaper referred to printing pictures of “souvenirs” in the plural. The three French survivors later told their story to the newspaper Le Matin. This account was translated into English and subsequently carried in The Times. It referred to them each as ‘M. (surname),’ which is nothing more than ‘Monsieur,’ equivalent to the ‘Mr’ prefix in English. The Sun did the same with Maréchal. There was no mention of the pack of cards, but this is surely insignificant as the Sun had proved its existence. Such treasures would be certain auction ‘hot cakes’ today. They are intrinsically emblematic of the uncertain vagaries in the deadly game of chance enacted that night – when icebergs were trumps. It is noteworthy that the initials in the signatures of the latter pair concur with their given names, Alfred Ferdnand and Paul. But the Maréchal signature clearly seems preceded by a ‘G,’ whereas his name was Pierre. It turns out one of his middle names was “Georges.” Perhaps this is why he styles himself as he does on the playing card. There then appears a date: apparently ’14 Avril 1912,’ the night she struck. 'Avril' is the French word for April. Other pieces of writing subtending to the date are more difficult to make out, but would appear to show the time of the collision, rendered in the French style as 11 h 40, plus the words "carte de bridge sur Titanic." No mention is made of the fourth person at table. Obviously Lucien Smith was not in a position to sign the card, but he is not remembered upon its face. It is as if he were the dummy in the game of bridge they were playing. Only one player can win the auction in a game of bridge. Thereafter their partner’s hand is displayed face-up on the table for all to see, and the winning bidder directs the play out of that hand (dummy). It’s impossible to know who partnered whom, but in bridge notation the partners are known by the pairs North & South and East & West. If the names of the four Titanic players, and the order of partners, were to be considered alphabetically – purely whimsically, and for the fun of the game – then Chevré, Maréchal, Omont and Smith would be East, North, South and West. This would partner Maréchal and Omont as North and South. Chevré would be partnered with Smith, the American, as East and West. Rather an appropriate combination, considering their nationalities. Hearts is the second highest-ranking suit. A bid of ‘two hearts’ would be a fairly standard winning contract, requiring the successful bidder to win two tricks over the standard seven (meaning nine tricks out of 13). A trick comprises four cards, one played by each of the quartet, with the winning bidder directing dummy. A player who becomes dummy would frequently excuse themselves in this situation, going to have a cigarette, pour a drink or fetch food. He could also be the first to collect a little ice. There is no evidence, of course, as to the nature of the specific game being played, except that one was underway. We do not know if hearts were trumps, or if any individual was dummy. Perhaps the bidding process had not been concluded. But if Maréchal literally wanted to “resume the game”- as specifically stated - and not just resume playing, then he would have had to gather up the cards carefully. The various hands would have had to be separated in some way. If completed tricks were already arranged on the table, he would gather these and put them in a separate pocket. Yet even in mid-trick, reconstituting the exact moment in the game need not present too many difficulties in keeping particular sets of cards apart. But assuming the auction process was still underway, it would be all too easy! 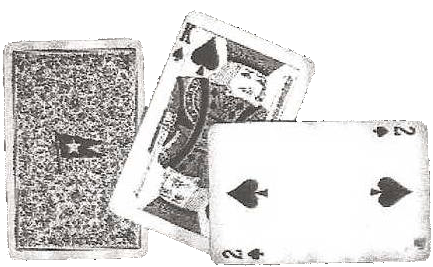 Unplayed hands placed face downwards could be gathered up in the order of North, East, South and West – the order in which players must be sitting so that both sets of partners face each other. Dealing 13 cards ‘off the top’ from the pack to each player in turn would allow the game to be exactly resumed on the Carpathia – had all the players survived, and had they wanted to return to aimless and amusing pastimes after the great trauma they had endured. But now comes an interesting consideration. It may be odd, even ghoulish, to imagine – but since Smith did not survive, he could become the de facto dummy on the Cunarder. For example, if Maréchal had won the bidding (or was destined to win the bidding, supported by his partner Omont), then it would be a matter of Omont taking over Smith’s role as West in our assumed example. Omont would then literally be playing the dead man’s hand. There is a reason meanwhile for contemplating, wistfully, that the auction might already have been won and the game underway. Maréchal is the man in possession of the cards. He gathered them up. He is the man who signs an individual card as the first name. The winning bidder always directs the game, controlling the cards out of dummy. If his mind is governed psychologically by the game of bridge, then after signing a card first himself, he would naturally ask one of the opposing partners to sign next. Omont signs. Maréchal, if his partner has survived, would want his partner to sign (bid) third in sequence. Chevré now signs. If the cards are being signed according to the notation and etiquette of the game of bridge – and it would be very appropriate to think they were - then it would be fitting if a dash or a space were to be inserted between the names where Smith’s signature should go. The sequence is always N, E, S, W. If Smith had been East, for example, a sequence conforming to the card game would have shown Signature, dash, Signature, Signature. Smith would be announcing a “pass” from beyond his watery grave. Instead there are three signatures in strict order. This might also subtly suggest that Smith was indeed West in the game of bridge being played by these gentlemen on the Titanic that night. One thing is sure - while they all had been going west, Smith was the sole card player to have ‘gone west’ by daylight. Naturally, all this is a case of ‘Gilding the Lily’- in what is an already gripping and tragic human-interest story, garlanded with gaming cards. But there’s no harm in wondering – after all, it was Lewis Carroll in Alice in Wonderland who used a pair of playing cards as characters tasked with gilding the lily. In that case, it was the small matter of using a paintbrush to turn white roses red. And one of the pair in this exercise was the Two of Hearts. Yet there is also a serious point in all this. We know, unfortunately, what befell poor Smith, whose wife subsequently gave birth to their baby. But what on earth became of all these signed cards sent to friends? The original Conan Doyle volume, taken off the ship by Maréchal, contains no references to card games, although Holmes was typically a dab hand at all leisure pursuits. But there are two sinkings in separate stories in this volume – involving vessels named the Gloria Scott and Norah Creina. In the latter case, three men leave a dead man – and escape in a rowboat. And in the very last story, The Final Problem, Holmes himself goes down to a torrential demise in the Reichenbach Falls. Sherlock Holmes first editions fetch commanding prices. One that had cheated destruction in the sinking of the Titanic would be worth a fortune.